There are a lot of crashes on Fulton Road in Cleveland. In fact, from 2015-2017 there were over 130 crashes. It’s time to provide final feedback on the first phase of the reconstruction of Fulton Road. 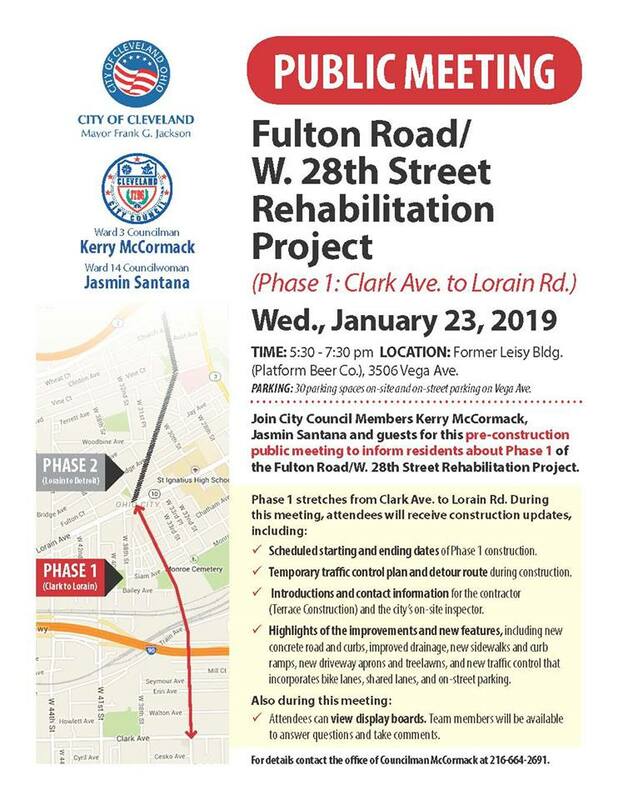 This phase will reconstruct Fulton Road from Clark Avenue north to Lorain Avenue, and work is due to start as soon as February. 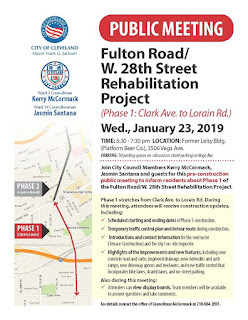 This meeting is hosted by the City of Cleveland, Ward 3 Councilman Kerry McCormack, Ward 14 Councilwoman Jasmin Santana, Metro West Community Development Organization, and Ohio City Incorporated. As it is today, Carnegie Avenue in Cleveland is a dangerous street. From 2015-2017, there were 737 crashes on Carnegie Avenue from E. 30th-E. 105th – 20 of which involved pedestrians or cyclists. This is unacceptable and now is our chance to plan a Carnegie Avenue that is safe for all users. There is an Open House you can attend and share your experiences as a cyclist or pedestrian, and express your desires for a safe Carnegie Avenue. Where: PNC Fairfax Connection (8220 Carnegie Avenue).